This was the 20th broadcast of Shawa Gohan. Sawako was wearing a black, low cut, long sleeve shirt. Her hair was up, with slight curls on the sides. 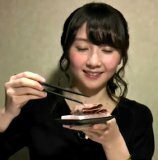 Sawako said she likes cheese, and wants to try some meat with cheese. 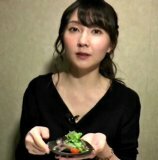 She likes the raclette cheese on bread at the Tsukada Noujou Hokkaidou store. At around the 11 minute mark, they switched to the outdoor video. But since it was very cold, they went to the restaurant right away. The restaurant was a yakiunku restaurant, Gyuu no Tatsujin -Private- Shinjku Honten. Sawako read some mails while waiting for the food. Then the food came. There was a salad with honey mustard dressing. Then there was a yukke. After that the various yakiniku meats came. At around the 32 minute mark, they switched back to the studio. Sawako rolled the die, and got a 2. So the next stop will be Takadanobaba. But there was a surprise. Since this was the 20th broadcast, they will leave Tokyo and the next broadcast will be from Nagao. The Takadanobaba broadcast will be the April broadcast. The members only video was around 25 minutes. Sawako said she saw a TV show about bath towels. She said she changes her towel every time, but since it's too troublesome to wash the big bath towel everyday, she uses the smaller towels. She was surprised that most of the people on the TV show used the towels more than once. 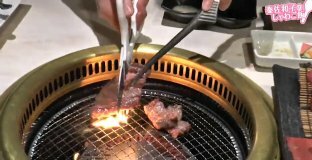 Sawako had never eaten such thick meats at yakiniku before, so she doesn't know how much she should cook it. She cooked most of them until they were burned on the outside, but pink on the inside.